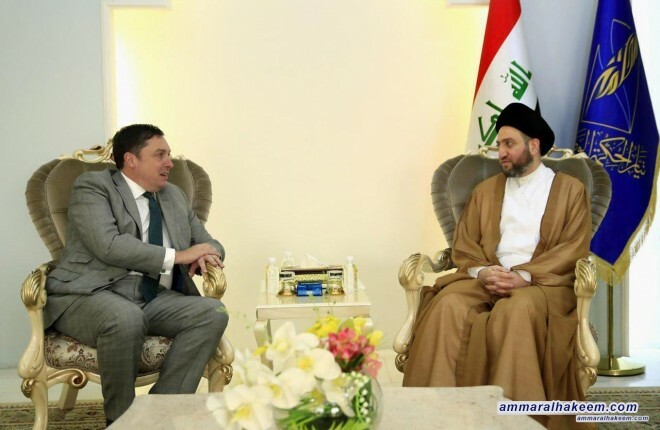 Head of the Al-Hikma National Movement, Sayyid Ammar al-Hakim, in his office in Baghdad received Ambassador of the United Kingdom to Baghdad, Mr. John Wilkes Wednesday 5/9/2018. His eminence with Wilkes discussed bilateral relations between the two countries and means to strengthen these relations, his eminence indicated that Iraq had being well under way in promoting democracy, stressed the need to conclude the subject of forming the future government so to proceed on assuming the responsibility for the advancement of services and development in the country. His eminence reiterated that the national majority represents a realistic solution to many of the issues that accompanied the political process since its establishment in Iraq, and indicated that the national majority will produce a strong, firm and courageous government. Regarding the events of Basra, his eminence stressed that people of Basra and the Iraqi people have the right to make peaceful demonstrations and demand a free and decent life, the security services are to understand the suffering of the people and their anger over the deteriorated services, and stressed the importance of protecting the lives of demonstrators and not damaging public properties.